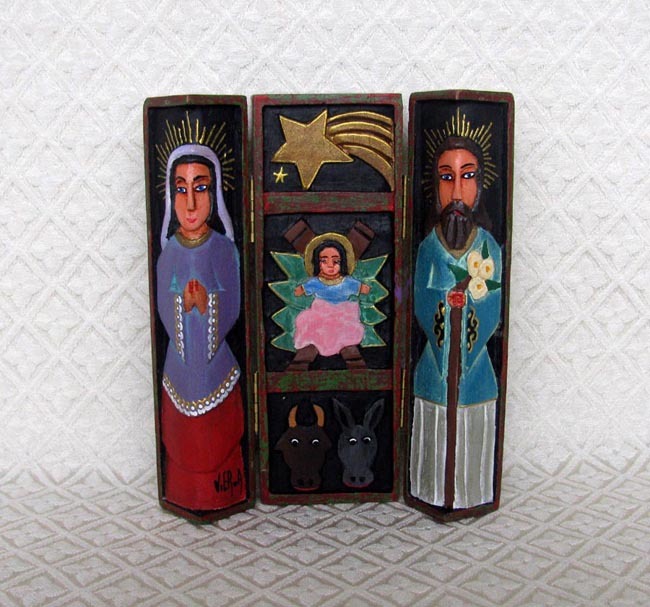 This triptych of the Holy Family is hand-carved in saqui saqui wood and then hand-painted. The two end panels close into the hinged middle panel, forming a square shape. The scene measures 6.75 inches tall. The wood is carved by Felix Vera and then painted by Jorge Vierma (who signed the item). Both artists live in Tinaquillo, Venezuela. The artists started working together in 1999. They create many Catholic religion pieces like Saints, Virgin Mary advocations, and angels. The artists employ high-school and college students as helpers who need money to pay for their education.